Researchers at the Niels Bohr Institute at the University of Copenhagen are part of a high-profile European research collaboration where the EU will spend a billion euros to develop quantum technologies, which will provide us with 100 % secure communication, new supercomputers and more sensitive measuring equipment. The 20 selected projects will receive almost a billion Danish kroner for the first phase of the Flagship. The EU's largest research projects are the so-called Flagships and today, Monday, 29 October 2018, a new giant Flagship was launched in quantum technologies. The Flagship has just kicked off during a huge Quantum Flagship Kickoff in Vienna, where the first 20 projects will be revealed. Over the next 10 years, 1 billion euros will be spent on developing technologies that could fundamentally change the way we process information. Researchers from the Niels Bohr Institute are right at the forefront and have received money in the first round. The quantum researchers at the institute on Blegdamsvej in Copenhagen have great expectations for the European collaboration with colleagues from Holland, Germany, Spain, France as well as other European countries. "The EU Flagship provides a unique opportunity to engage in research alliances that link the strongest academic groups together in the effort to solve some of the major challenges facing society, such as security or supercomputing. The ultimate dream is to build is to build quantum computers that can solve problems that are impossible with existing computers – or a quantum internet, where unbreakable communication can take place risk free and security is guaranteed by the laws of quantum physics," explains Peter Lodahl, Professor　at the Niels Bohr Institute. A vital issue for our existing internet is security. It is essential to prevent financial transactions and confidential data from falling in the wrong hands. Quantum technology provides a solution to this problem in the form of quantum encryption, which is a 100 per cent unbreakable method of communication, as the method utilises the laws of quantum mechanics that originate from the research of Niels Bohr at the beginning of the last century. It is about coding information in a single photon – the fundamental component of light. If you measure an individual photon, the measurement will inevitably disturb the photon and thus you will know if someone has tried to "eavesdrop". On the other hand, if no disturbance is detected then you can be sure that the communication is completely secure. The great challenge is to apply it over long distances, which is why a ‘quantum internet’ is high up on the list. 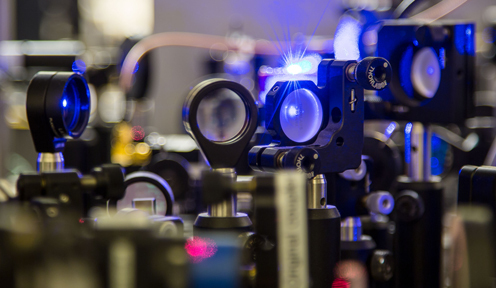 and later between two clouds of caesium gas – a breakthrough that will be very important for the future development of ultra-precise measuring instruments for, among other things, hospital equipment. Another area of research is to improve the sensitivity of the best motion detectors, namely the gravitational wave interferometers, which reported the first observation of gravitational waves in 2017. Jan W. Thomsen, Head of the research group ‘Quantum Metrology’ at the Niels Bohr Institute and Head of Department since September 2017, has also researched precision measurements with ultracold atoms, resulting in an atomic clock that only loses a second in 13 billion years. With such a precise measuring device it is, for example, possible to measure displacements in the Earth’s crust and could possibly be used to predict earthquakes. Atomic clocks are also found in the GPS satellites used for positioning on the ground. Peter Lodahl is the Head of the group ‘Quantum Photonics’, which, among other things, focuses on producing photonic chips that could be used for quantum technology based on light (photons). With regards to this, they have partnered with the private sector and the group is also part of the nationwide ‘Qubiz’ project funded by Innovation Fund Denmark. Peter Lodahl is also the Head of a new Center of Excellence, which will aim to develop the internet of the future – a quantum internet. The new research center ’Center for Hybrid Quantum Networks’ (Hy-Q) was officially opened 17 September 2018. Anders S. Sørensen is the Head of the research group ‘Theoretical Quantum Optics’, which develops theories for how to develop quantum information technologies in practice. To achieve this, the group researches a wide variety of physical systems from individual atoms, ions and photons to mechanical vibrations and superconductors in solid-state systems. In particular, the group is interested in quantum communications over long distances. The group is also part of the newly launched ‘Center for Hybrid Quantum. ...who was brought here on a professorship financed by the VILLUM FOUNDATION. The grant was the first example in Denmark of a private foundation financing a permanent professorship. Later, the University of Copenhagen signed a cooperation agreement to develop the quantum computer with a Microsoft investment of hundreds of millions and, among other things, established a development laboratory at the university. The Danish National Research Foundation and Innovation Fund Denmark also provided considerable funding for the project, the latter with DKK 80 million for the nationwide project ‘Qubiz’ together with the University of Copenhagen, Technical University of Denmark and Aarhus University. ...convert scientific advances into concrete innovation opportunities that can contribute to addressing some of the major societal challenges Europe is facing with regards to growth and jobs. The Flagship has a budget of 1 billion Euros over 10 years and will support large-scale and long-term research and innovation projects that aim to bring the quantum research from the laboratories to the commercial market.